This statistic displays the weekly reach of BBC television channels in the United Kingdom (UK) from fiscal year 2015/16 to 2017/18. 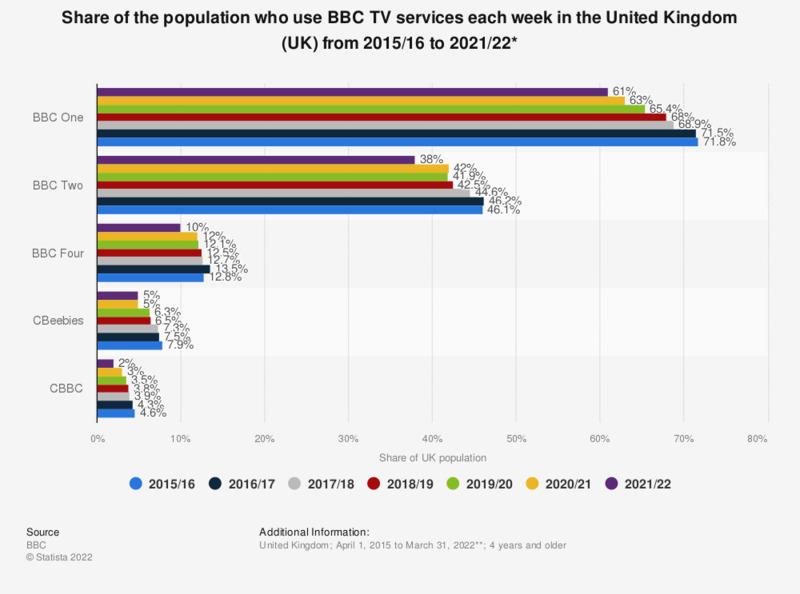 In the fiscal year ending March 31, 2018, BBC One had the greatest weekly reach, with 68.9 percent of the population using the service at least once. * The source defines reach as: "15 minutes for all channels and services on audiences aged 4+"
** BBC's fiscal year ends annually on March 31. Data for earlier than 2017/18 was published earlier by the source. *** BBC Three ceased operations in 2016. To what extent do you think the quality of programmes on the Public Broadcasting Service (PBS) in United States is good or poor? To what extent do you think the quality of programmes on the following television channels in the United Arab Emirates is good or poor? Which of the following is your favorite Doctor in the BBC series Doctor Who? How interested are you in the BBC TV series Doctor Who? To what extent do you think the quality of programmes on CBS in United States is good or poor? To what extent do you think the quality of programmes on the NBC in the United States is good or poor?